Jim Mulhall, a liquid milk supplier to Glanbia from Kilkenny. Image: Dylan Vaughan. Dairy farmers that produce fresh milk have hit out at unsustainable discounting of milk by Iceland and Aldi in the recent weeks. The Fresh Milk Producers group slammed the move as ‘socially irresponsible’ and said it is putting a complete supply chain of fresh perishable food in danger of being decimated in the Republic of Ireland. Group Chairman Jim Mulhall, a liquid milk supplier to Glanbia from Kilkenny said “Aldi is currently selling fresh milk at €1.30 for 2 litres. 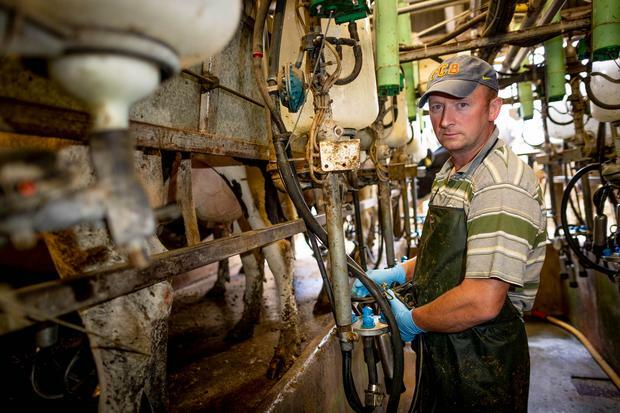 “This is below the true cost of putting that milk on the shelf and is not economically sustainable. Iceland is also offering a deal of 4 litres of milk for €2.60 litre. Mr Mulhall said that at this price point per litre, the supply chain can not support a sustainable price to pay the primary producer. “While retailers may claim to bear the burden of below cost selling, history has shown us the opposite will ultimately happen, with price cuts ending up on the door of the farmer. “We have seen this in other fresh food products such as in the vegetable sector, where these unsustainable discounting practices has resulted in unviable margins in this sector and we will not sit back and watch this happen to our product. “In much of retailers promotional advertising, claims to have developed a plan that includes sustainable sourcing and emphasis on social responsibility is promoted. “But any fair-minded person can see that this aggressive undermining of the value of fresh milk through destructive discounting is neither sustainable nor socially responsible, he said. He said retailers make a lot of use of farm and farmer imagery in their promotional material and within their stores. “It is clear that those messages have neither coherence nor credibility, and I believe that all retailers must prove to farmers just how genuine their commitment is by living up to these messages and end unsustainable discounting,” he highlighted. It comes as a recent National Milk Report showed that in the fresh milk market, 62pc of milk sales in retail outlets were sold as ‘own label’ according to the report and these ‘own label’ sales in 2L packs were retailed at an average discount of 27pc on processors’ brands. Irish Creamery Milk Suppliers Association President Pat McCormack said “we can see here – yet again – the problems that inevitably occur in the race-to-the-bottom when milk is used as a “loss leader” to attract customers into the shop. “The retailers are now doing to the processors what the retailers have been doing to the farmers for decades. “ICMSA is not calling for dramatic increases in milk prices but we do support a fairer division of the retail milk price that adequately rewards the person who did by far the most to get the product to consumer stage – the farmer”, said Mr McCormack. Commenting, an Aldi spokesperson said to ensure it continues to provide the very best value groceries in Ireland, it has reduced the prices of over 50pc of our product range in the past 12 months. Meanwhile, Iceland Ireland said it provides customers with fantastic quality and value in fresh, frozen and ambient grocery products from leading Irish and international brands. “We work with a range of suppliers and manufacturers in Ireland and in sourcing products from them we are proud to support jobs in the Irish economy while bringing customers quality products at great prices.